Some things are just meant to be. That was our inspiration for the Delightful Destiny menus. It blends green hues and bold lettering to really make a statement. The lines around the edges create a perfect border, drawing the eye immediately to the center where your personalized greeting and announcement are showcased. Use our suggested wedding font, or choose your own for a more personalized look. This design is also available in reply cards, menus, place setting cards, and thank you cards. 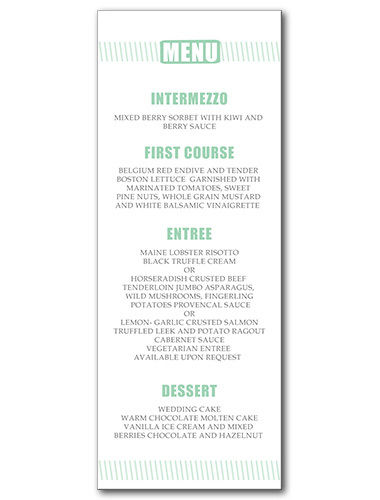 Delightful Destiny Menu For the best experience, we recommend personalizing your stationery on a desktop computer.